Despite its economic prowess and being home to many billionaires and millionaires, China remains a dictatorship in which the Party is the State and rules the State. As such, it has an office for religious affairs: all believers must belong to a house of worship which is registered locally and is part of one of the five recognized faiths: Buddhism, Catholicism, Christian-Protestant, Daoism, Islam. Russia is trying to get China to recognize the many thousands of Orthodox living in Xinjiang, Beijing, and the northeast with little luck. Chinese Communists are not known for fair play: as you can read below, Catholics alone are owed 13 bill EU worth of confiscated property that has not been returned since religious practice was re-legalized over 40 years ago. And there was a bitter “war of the crosses” in heavily Christian Zhejiang province that is still not settled. Now the government is ordering everyone to the capital. The government prizes social stability above all else, and Communist China faces thousands of local protests every year against corrupt officials or over-zealous Party members. Religion can help the government – or the government can turn and clamp down hard. The article below gives links to what’s going on, and what the religions face in 2016. Rome (AsiaNews) – The Ministry of Religious Affairs (more precisely: the State Administration for Religious Affairs, SARA), has announced on its website that it is preparing a national summit on religions, which will discuss the revision of norms governing the control of faiths. Many Christians interviewed by AsiaNews fear that this will only further plunge the life of communities into darkness as they struggle against a swelling tide of increasingly severe restrictions. SARA deputy director, Chen Zhongrong, said that the summit will discuss the “intensive” formation of local religious leaders. Moreover, President Xi Jinping is set to attend the meeting. The date has not yet been officially announced; some say that it will happen later this year. However, preparatory meetings have been taking place for some time now. So far this year, Yu Zhengsheng, Politburo member and previously Xi Jinping’s successor as Shanghai party secretary, has made several visits to representatives of the five official religions (Buddhism, Islam, Taoism, Protestant, Catholic). In January, he traveled to Baoding, where there is a strong presence of the unofficial Catholic community. He also chaired a meeting of the Commission for Religious Affairs of the Chinese People’s Political Consultative Conference (CPPCC). What is far from clear is the topics of the summit. In an interview with Wenweipo (a pro-Beijing newspaper in Hong Kong), SARA’s director, Wang Zuoan, said that the time is now ripe for a comprehensive review of the norms governing religions and that agenda topics would include property rights and the use of internet. The issue of property rights is the source of a bitter dispute between the different religious communities and SARA. Many properties – buildings, hospitals, schools, land – expropriated under Mao Zedong to be used “for the people”, under a law passed by Deng Xiaoping should have been returned to their respective owners. Instead, SARA members and offices liberally use these properties for their own purposes, even registering them as personal property. According to Chinese law, property to the value of an estimated 13 billion euros should be restored just to the Catholic Church, not counting the other faiths and the Orthodox. Over the years the government has expropriated houses to build hotels and buildings at the time of the Olympics and seized farmland and villages to grant to the land for industrial use. The complaints of the injured parties have never been upheld. Church environments fear that the new regulations could simply ‘clean the slate’ of any claims heretofore made by bishops and communities. Among Catholics, there are those who suspect that the death of Fr. Wei (Yu) Heping, who was very active on the internet, is due to a conflict with the authorities, even though they continue to say that the priest “committed suicide”. So far Xi Jinping has hardly ever spoken of religions, but in May he met with the United Front (the representatives of all social organizations outside the Communist Party). In his speech he insisted on the “sinofication” of religions and that they must strengthen their independence from foreign influence. In short, he said, this is the only way they will survive in China. As for the Catholics, if this “sinofication” means inculturation, namely an entering into dialogue with Chinese culture, then this has been happening since the time of Matteo Ricci and his followers, such as Paul Xu Guangxi (1562-1633), a national hero and scientist, as well as great Catholic. The “sinofication” had a positive outcome and led to the first Vatican delegate in China, the great Celso Costantini (1876-1958) who pushed for the ordination of the first Chinese bishops. He proposed a curriculum in seminaries that integrated theology with traditional culture. He also suggested construction of churches that were more responsive to the architectural style prevalent at the time in the Empire. Unfortunately, the “sinofication” referred to by Xi seems somewhat different. Last May 29, the United Front website published an explanation of the term used by Xi Jinping. It says that the term is first of political, namely to support the government of the Chinese Communist Party and socialism and obey the laws of the State. Secondly, it is nationalistic, meaning that religions must act in the best interests of the Chinese nation and the Chinese people. Thirdly, it is ideological in so far as religious activities must be guided by socialist values ​​and be imbued with traditional Chinese values. The Bible must be interpreted so as to promote what is good for social development. The scope of this type of “sinofication” is even clearer in light of the statements published in the China Nation Post on April 21. The text underlines that in order to become more “Chinese” Christianity must try to be useful to the society into which it is inserted. It must give up its claims to “superiority” and not be exclusivist, rather it must coexist with other religions. It must interpret Sacred Scriptures in the light of traditional Chinese culture. The newspaper warns that if this adaptation to becoming Chinese – this “sinofication” – does not take place, the foreign religion cannot survive and will be erased. Agreement can be reached on some aspects of this “sinofication”: the witness of Christians always bring “benefits” to society. The Chinese Church has long been at the service of families, the poor, immigrants, the handicapped, the sick. In the same way it has long been committed to the dialogue between Chinese faith and culture. In fact, this “sinofication” mask an attempted power grab on religions. On November 30, in an article published by the “Global Times”, Zhu Weiqun, president of the Committee for Ethnic and Religious Affairs of the CPCP said that reincarnation in Tibetan Buddhism is a matter for the Communist Party and that Beijing will determine who will succeed the Dalai Lama. In January, new rules were introduced for Muslims in Xinjiang, banning women from wearing the burqa and young people from growing a beard. Often universities rectors forcibly ban students from fasting during the Islamic holy month of Ramadan. Last year Christmas Parties and Christmas ceremonies were banned from universities and schools. While in Zhejiang thousands of crosses were torn down from bell towers and churches so as not ruin the skyline of capital-communist modernity with Chinese characteristics. The Party’s drive to have total and absolute dominion over religions is also evident from the themes of the dialogue between the Vatican and China. From information that has arrived from China it would seem that Beijing’s proposal is limited to complete recognition by the Holy See for all official bishops (even illegitimate and excommunicated bishops), without any mention of the unofficial bishops and those in prison; Vatican approval of the government recognized Council of Bishops, which excludes underground bishops; approval of the competency of this Council (and not the Pope) in the appointment of new candidates to the episcopacy who will be “democratically” elected (in short according to the suggestions of the Patriotic Association). The Holy See must approve the Council’s appointment and has a weak veto only in “severe” cases, which must be justified if used. If the Holy See’s justifications are considered “insufficient”, the Council of Bishops may decide to proceed anyway. The Vatican’s requests for the liberation of imprisoned bishops and the recognition of underground bishops have been completely ignored. 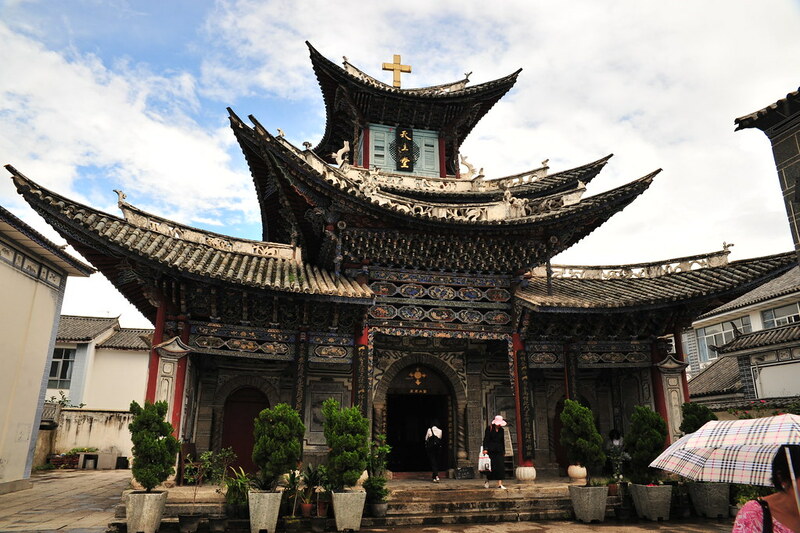 A few days after the meeting between the Holy See and the Chinese delegations in Beijing last October (October11-16), official Catholic bishops and leaders in the provinces of Guizhou and Shandong officers were made to attend a study session on the “sinofication of religions and Christianity,” in which the above criteria and control over episcopal ordinations were reiterated. Underground bishop John Han of Hebei, died in prison. He was cremated six hours after his death so no one could see his body. At the age of 62, he had been sentenced to 30 years in prison for his ministry. Obviously, you need a large dose of humor to call this respect for religious freedom. In fact we see a widespread penetration of ideology and of party control in the most intimate depths of faith, dogmas, beliefs, to disfigure the face of the religion, leaving only an empty shell, a puppet in the Party’s hands. Moreover, it is now clear to many that the sinofication, the new regulations, the increased controls have only one purpose: to preserve the monopoly of power of the Communist Party of China (CPC) and remove or crush any person who might challenge it or its very existence. For years, the CPC has been suffering from a syndrome of “the Soviet style collapse “, for fear of ending up like the Communist Party in Russia. Xi Jinping has often spoke about this, warning against any “revisionism” and any criticism of the Party’s history. China has always looked with fear upon the end of the Soviet empire. In 1989, when the Berlin Wall fell, the CPC blamed the collapse on Solidarnosc, Poland and Pope John Paul II. And so since then Beijing has reinforced repression against free trade unions, against attempts of regional autonomy, against the Catholic religion and religions in general. After the Tiananmen massacre, the CPC tried to justify its use of force by granting economic well-being to society. But the world that has emerged is full of huge economic imbalances, pollution, injustice, violence, corruption and now the support of the population has shrunk. For this is an ongoing struggle against any person who would throw a shadow on the power of the Party: intellectuals, bloggers, journalists, lawyers, human rights and … religions. The fear of religious communities is even more acute because adhesion to a faith has even penetrated Party members, so much so that a few months ago a ban on members practicing any form of religion was issued. Conversions and return to the practice of the faith is spreading like “weeds” in Chinese society to the point of quietly overturning government statistics. In fact, according to Beijing there are only 100 million faithful belonging to the five official religions in China. But already in 2007 some professors at the Shanghai Normal University published a survey in China Daily which showed that the number of believers is around 300 million and more. The real tragedy in all of this, is that in addition to its obsessive fear of a “USSR style collapse”, Beijing is also suffering from a “suicidal” tendency, given that in its attempt to eliminate or stifle religions – and in particular the Christian communities – the Party is in reality erasing the only means by which it could give real meaning and cohesion to the Chinese society, which is currently prostrated by decades of materialism, individualism, suspicion, conflict and existential emptiness. Sister Han Yuxi cares for a leper – this photo comes from the Communist paper China Daily! « List of Churches and Monasteries Ruined by ISIS/ISIL in Syria: And the World does what?